REDDING, Calif. - The Simpson University Music Department and Oxford Suites are joining to present a special performance by ATOS Trio, internationally acclaimed piano, violin and cello musicians. The concert is at 3 p.m. Sunday, Feb. 9, inside the Heritage Student Life Center on Simpson University’s campus, 2211 College View Drive. Tickets are $15, available online at http://simpsonu.edu/musicevents or at the door. “These are world-class musicians, and the North State is really in for a treat. It is truly rare to be able to experience music this good in a live and intimate setting,” said Dr. Dan Pinkston, Simpson University Music Department Chair. ATOS Trio has been described as a highlight in the concert series of many elite venues. During their last season, ATOS Trio performed at Wigmore Hall (London), Carnegie Hall (New York) and the Concertgebouw (Amsterdam). In 2009, ATOS was named 2009-2011 "New Generation Artists" by BBC Radio 3. Learn more about the group at http://www.atos-trio.de. Each year, the Simpson University Music Department works to provide a guest artist experience in its concert series to inspire students and the broader North State community. 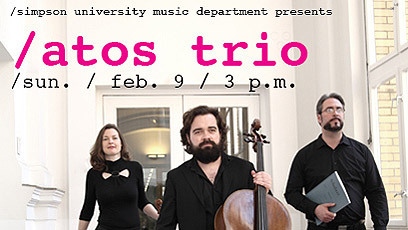 To learn more about the ATOS Trio event, visit simpsonu.edu/musicevents. “It’s a great privilege to have ATOS Trio at Simpson University; the trio represents some of the most passionate, skillful, and beautiful chamber music possible,” Dr. Pinkston said. Simpson University Music Department’s commitment to offering unique and professional guest artist experiences is just one advantage of studying music at Simpson University. To learn more about the music program, visit simpsonu.edu/music.